Mapúa University is now offering Master in Business Analytics (MAN). The University’s MAN program is the Philippines’ first graduate program in business analytics aiming to produce topnotch data science and analytics practitioners, who are in demand in today’s industry. Students of the program will undergo a practical curriculum. Trainings and fieldworks will be based on live business problems that can be solved by analytics. They will also receive extensive trainings on communication to effectively deliver outcomes for business decision-makers. Teamwork and peer-to-peer learning are also keys to MAN students’ success. MAN program’s practical curriculum is designed to address the needs of different industries – banking, insurance, telecommunications, power and energy, manufacturing, retail, distribution, and the government. The program was patterned after Master of Science in Analytics (MSA) of North Carolina State University’s Institute for Advanced Analytics whose mission is to produce the world’s finest practitioners of analytics by mastering complex methods and tools for large-scale data modeling with a passion for solving challenging problems through teamwork. “The collaboration of Mapúa University and North Carolina State University for MAN was made possible through the kind sponsorship of Dr. James Goodnight, founder and CEO of SAS,” said Dr. Vea. Dr. Michael Rappa, Goodnight director, and distinguished professor and founding director of the Institute of Advanced Analytics, along with his faculty, shared program details, best practices and decade-long experiences to Dean Ariel Kelly D. Balan of Mapúa’s School of Information Technology during his visit in NC State for the said collaboration. “Imparting MSA’s discipline to Mapúa’s MAN reaches our degree’s own objective. It is a commendable act of Mapúa to take this unprecedented step in the Philippines as it contributes greatly in promoting the global practice of data science and analytics,” said Dr. Rappa. Mapúa’s MAN will also receive sponsorships from leading organizations of the industry. The Yuchengco Group of Companies through its member companies – RCBC, RCBC Savings, Bankard, Malayan, and FNAC – will be the pilot sponsors of the program. These sponsors will provide students the exact environment for learning application – business problem, data, real-world problem solving experience, and presentation of results. “The Master in Business Analytics program in Mapúa is my personal commitment to uplift the quality, technical capability, and industry-readiness of our bright young Filipino professionals so they are better equipped to contribute to their employers’ mission and share positively in the building of our nation,” said Helen Yuchengco Dee, Chairman of the Yuchengco Group of Companies. Guest lecturers who are experts in their fields will also provide added practical education by sharing cases and applications of analytics in their own fields of expertise such as banking, telecommunications, retail, big data, artificial intelligence, and machine learning. Mapúa will also be utilizing its School of Information Technology’s partnership with Cloudera, SAS, and SAP. These companies will be the tools provider of the University’s MAN program. Students will be given the opportunity to master the tools and can choose to obtain vendor certifications while completing their degree. 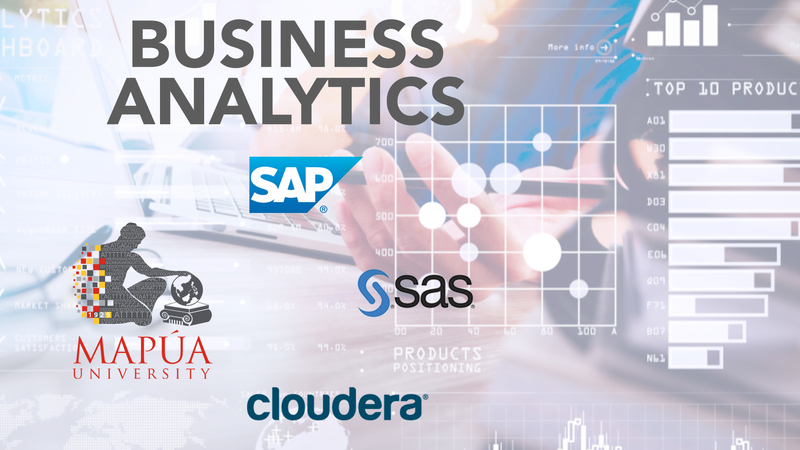 Mapúa’s Master in Business Analytics is the first program in the Philippines to be supported by leading Hadoop provider, Cloudera. SAS was instrumental in designing the program. According to Sonny Halili, a prime mover of Mapúa’s MAN, who started and expanded the commercial usage and applications of analytics in the Philippines, and the founder and CEO of Intellection, the country’s first firm to provide solutions to business problems through advanced analytics, the new master’s program of Mapúa University will harness the skills of its students to create better employment opportunities in the growing careers of business analytics. “I’ve designed the program to fit the needs of the industry. Students will be taught, mentored, and coached on the essential technical and soft skills that employers look for in a data scientist. I know this because I have been hiring hundreds of them since the early 2000s,” Halili said. Students of MAN will be presented to the sponsors and the business community a few months before graduation so both students and employers can explore employment opportunities immediately after graduation. Mapúa University’s Master in Business Analytics is among the first offered program by the University in the country. Recently, Mapúa has also offered Master of Engineering in Industrial Engineering (MEP-IE), the Philippines’ first fully online engineering graduate program.